Last week we had another of our days when we extend our experiences by visiting an area where we do not usually work. 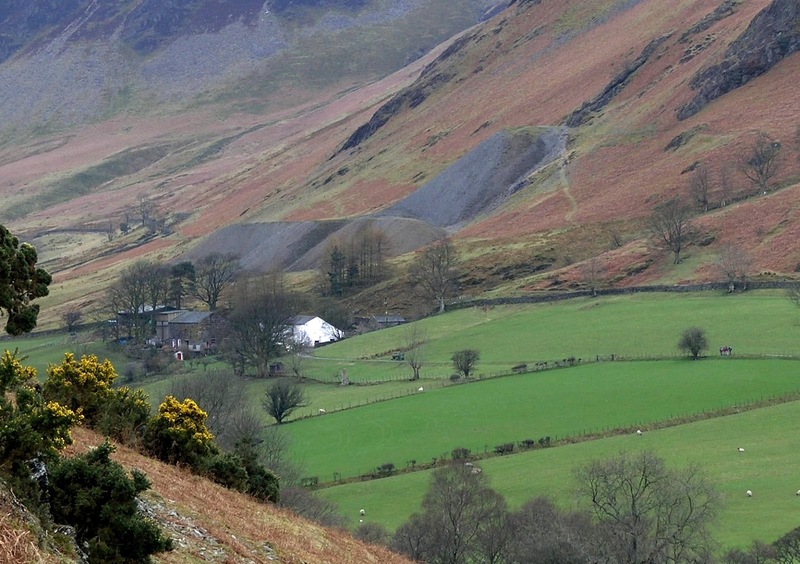 This time it was to Whitehaven and Ennerdale in the west of the county. 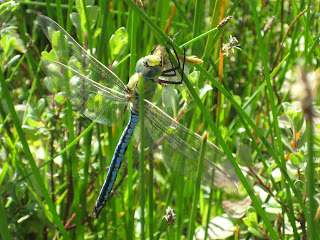 Chris, the Trust’s ranger for that area, was running a volunteer day and a guided walk. He took us walking around the Haig Pit area and the reclaimed land from the coal-mining industry that was centred there until 1988. We then moved on to Monks Bridge on Coldfell near Calderbridge. This is the oldest packhorse bridge in Cumbria. It was built for the monks of Calder Abbey , originally Savigniac monks and then later on Cistercians from the larger Furness Abbey in the south of Cumbria. It would have been an important part of the route for transporting iron ore from Ennerdale across Friar Gill to be smelted at the smithies on the fells. Unfortunately a tree had taken root so near to the bridge that its roots were threatening to cause damage so we had to cut it down. We dragged it away from the bridge for burning and took the opportunity to have a barbecue. Once again, Chris had organised a great day – two great locations, some essential work carried out and the weather allowed us a barbecue! June saw the launch of the Barrow Spring Watch in association with Cumbria Wildlife Trust, Natural England and the National Trust. The launch was held at Barrow Dock Museum on a very dull drizzly morning. We ran games and crafts and there was lots of wildlife to learn about, both the kids and adults that attended seemed to enjoy themselves. During the half term break we ran a stream dipping event which seemed to coincide with the worst week of weather in June. However three families braved the rain and had a whale of a time and met up with lots of creepy crawlies from the creek! For the bigger kids we put on an Introduction to plants of the sand dunes and coast walk and talk and ran a number of guided walks for all sorts of groups. We participated in Barrow's Big Clean run by the Evening Mail and Barrow Borough Council which involved a mass litter pick along the beach. It was well attended particularly by the dignitaries from the Council, the police and our usual hardy volunteers. 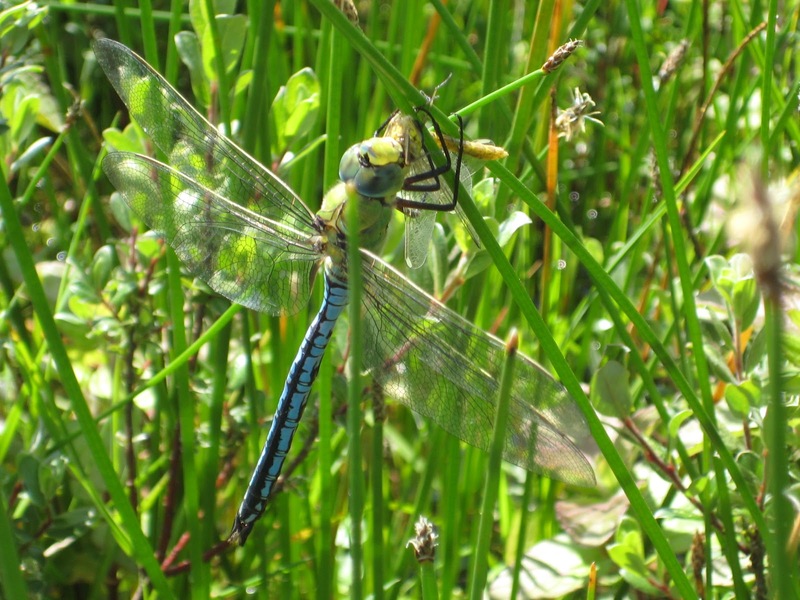 The dragons came out in force with the emperor dragonfly stealing the show from the four spotted chaser and the common darter. 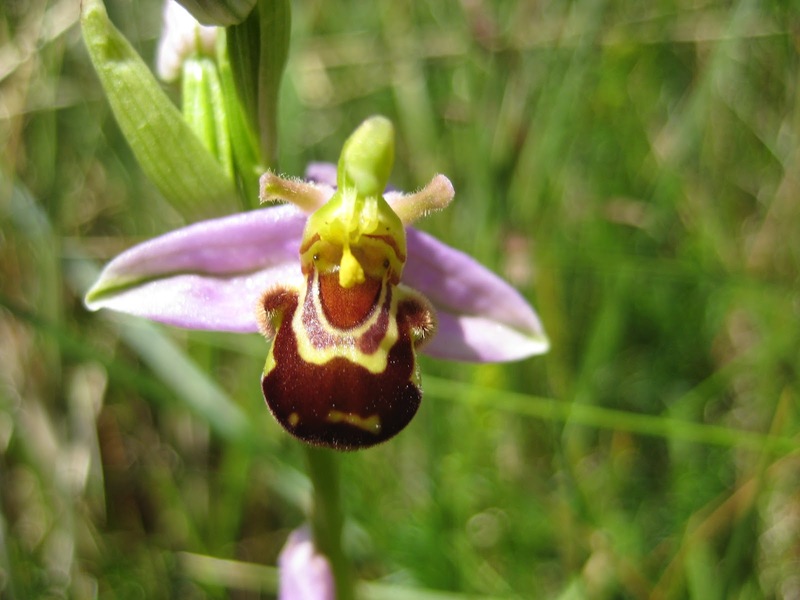 We have stunning displays of orchids including common spotted, heath spotted, early marsh, northern marsh and the very beautiful bee orchid. 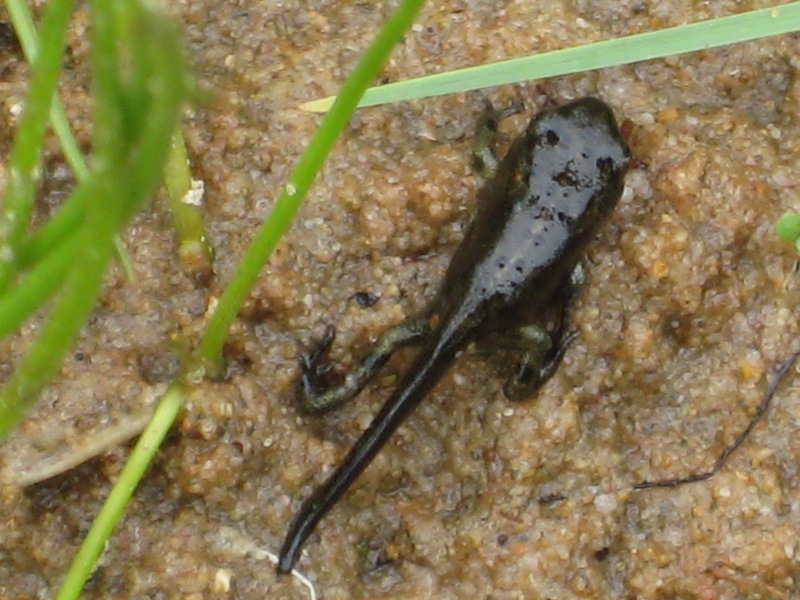 Natterjack toadlets have now started to emerge and can be found running for their lives on the boardwalks. Defying the rain and the midges. 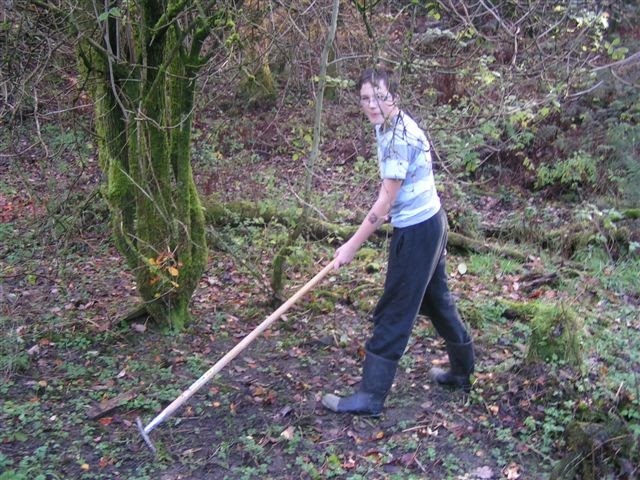 We have recently embarked on a big job with some of our volunteers hand weeding around oak saplings planted on a woodland expansion zone below Falcon Crag. These were grown from acorns collected locally by the National Trust to be grown on. The saplings were then planted out by school children. For a few years, the bracken on the slope will outgrow the saplings and would deprive them of light so we need to clear the area surrounding each one for about a 1 metre radius. This is a laborious process of first finding them amongst a metre or more of bracken growth and then cutting that back using a sickle. Heavy rain that the camera can't 'see'. The weather was not particularly kind to us and we worked in a relentless downpour and were thoroughly soaked. Conditions were just right for there to be enough midges to be troublesome. We resorted to Avon’s Skin-so-Soft bath oil to give us some protection against them! Despite the aggravation of the rain and the midges, the volunteers completed an extraordinary amount of work and maintained their usual good humour. As an Upland Ranger our jobs can be quite varied, one day we’ll be on the top of a mountain on a drain run, the next removing a piano from a disused quarry, yes you did read that right! As you may expect this wasn’t a normal everyday request, indeed I doubt it will be a request again in the near future, but as jobs go it was definitely an interesting and challenging one. So think like an Egyptian we did as we carried some old fence posts into the Quarry. Then it was a case of lift and pull the piano over the rollers, bringing rollers from the front to the back, moving quite rapidly once we got into a rhythm. In fact before we knew it we were at the light at the end of the tunnel and the trailer was in sight. With some delicate manoeuvring around the fencing at the entrance to the cavern we were ready to load it onto the trailer and take away to hopefully its new home at Wray Castle. First though they need to check it hasn’t got wood worm or any other bugs that shouldn’t be taken into the house and potentially cause some damage. 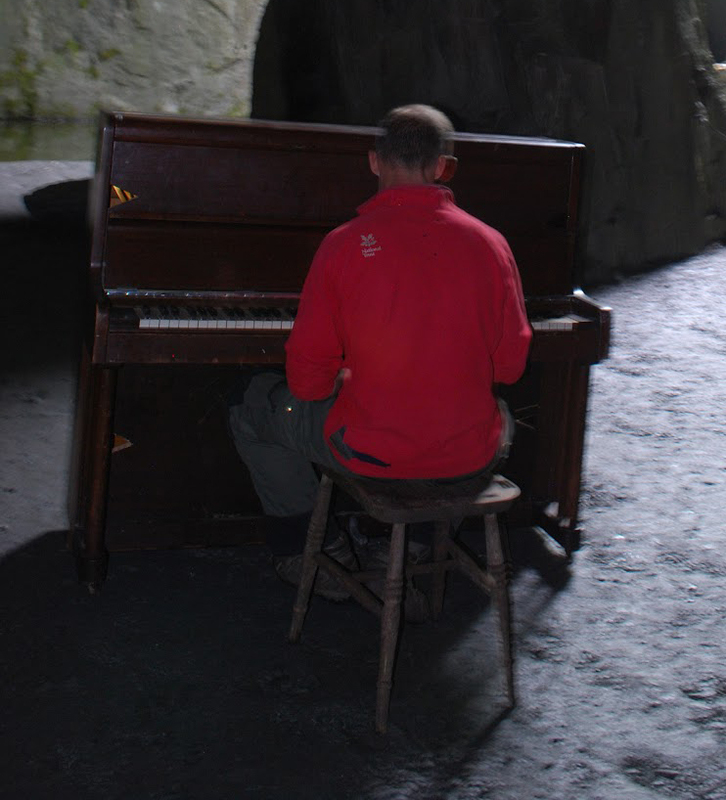 If it gets the all clear, then Wray Castle may be filled with some beautiful music! 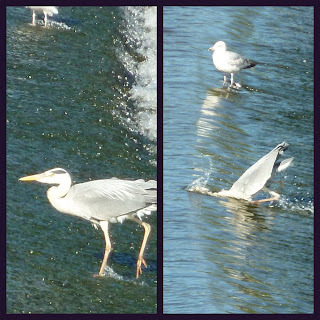 Post & photos by Sarah, Upland Ranger in footpath team. When I came to write this latest blog and reflected on what I had been doing, not for the first time, I realised what a fantastic place the UK is. Here in the Lakes it would be easy to take it for granted but the visitors are a constant reminder of how lucky we are to live and work here. We are part of a relatively small but accessible part of the globe where we can enjoy so many different experiences. In a couple of weeks I have been climbing in snow on Skye and have also enjoyed walking Roman walls and the historic city of Chester in glorious sunshine – this with my Canadian friends Kirk & Jo who were keen to visit some ancient sites. We three also did some climbing in the Lake District. I then spent some time with a large number of our fantastic, ever-willing volunteers working on an access-for-all footpath with the Fix the Fells team. That was followed by working with the Scouts, the Army Cadets and the Mountain Rescue Team to create the Jubilee Beacon on Catbells and the bonfire at Crowe Park on the lake shore. Around 2000 people enjoyed the bonfire and about 80 made their way up to the beacon where there was a great atmosphere and we could see several beacons on other fell tops. Soon after that, I was able to spend some time road-biking in Pitlochry, another fantastic area. These islands are so compact that we can easily access an enormous range of experiences even if we have only one spare day. It all led to thinking about the Trust’s project '50 things to do before you are 11¾'. During the rest of the year we are all going to be building some of those into our visitor experiences so I’ll be reporting on those soon. Meanwhile, why don’t you have a go at something near your home that you haven’t tried before? You can tell us about it by writing a comment on the blog. The Netted Carpet Moth is one of the rarest moths in the U.K and classified as vulnerable. It is vulnerable partly because the moth larvae/caterpillars are entirely reliant on a scarce annual plant known as Touch Me Not Balsam.It is the caterpillars' only food source.Both moth and plant are restricted, almost exclusively, to the Lake District albeit in small numbers and at just a few sites.One such site is at St Catherine’s in the East Windermere area. 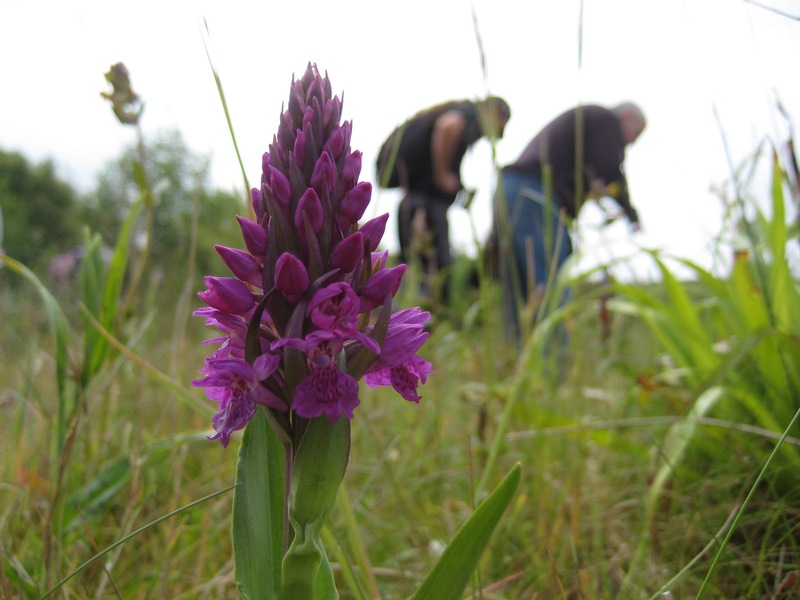 National Trust Rangers have greatly increased the numbers of plants here, and hence the moth populations over the years, by actively improving conditions for the plant. Touch Me Not grows well in damp open woodlands, especially after the ground has been churned up. 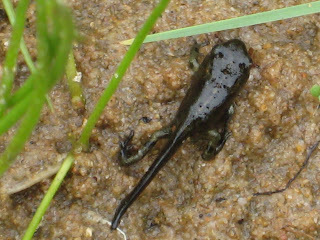 Severe ground disturbance is undertaken by rangers and volunteers at St. Catherine's in the winter and early spring, before the seedlings appear. A good stand of Touch Me Not Balsam at St Catherine's. Mid July 2011. 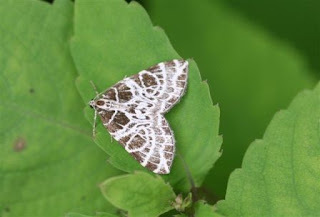 Touch Me Not also requires dappled sunlight to grow well; some wooded areas are managed with this in mind; branches have been cut back, and a certain amount of coppicing takes place. At Millerground, in 2009, the cutting down of non native trees has let in a lot more light. This has allowed touch me not plants to thrive here once again after many years absence. Finally, non native Himalayan Balsam is pulled up regularly to stop it over running and displacing the far less robust and far less common Touch Me Not stands. Over the next few months many National Trust tenants and other farmers will be hosting farm walks to encourage people to be more informed about what they as farmers are doing and farming's relationship with the landscape and conservation. This weekend will see many farms all over the country open their gates for "Open Farm Sunday" on the 17th June and the Friends of the Lake District are organising a series of events right across Cumbria over the summer called "Farming Landscapes". Working for the National Trust in the Lake District we can get a bit blase' about the landscape we work in but when talking to visitor, encountering a magnificent view as the cloud lifts or witnessing a fantastic sunset you realise what an amazing place it is to live and work in. But this magnificent landscape didn't happen by accident, but is a combination of geology, natural habitats and human intervention to form what we see today. The biggest impact in forming this rich mosaic of forms and colours has been the way farming over the last few thousand years has developed and adapted the landscape to produce what we see today. 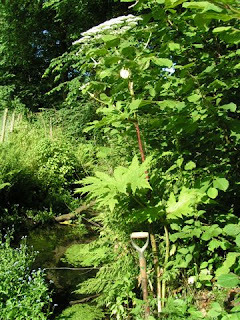 Other influences have also contributed over the centuries from mining and quarrying which led to many of the much used tracks and paths to the coppicing industries which used the woodland to produce the raw materials for the industrial revolution. Later the Victorians developed their large estates and brought in exotic trees and designed landscapes to further develop what nature and agriculture had produced before them. Last weekend myself and Richard hosted one of the "Farming Landscapes" walks on the land I rent from the Trust at Park-a-Moor. We looked at how I manage the farm land and how this works closely with how the Trust manages its woodland and the flora and fauna within it. We also looked at some of the industrial archaeology left by the charcoal burners and the monks who farmed the land and how their legacy is left in what we see today. We also looked at how current farming methods and the impacts of national and international events have such an effect on how farming is undertaken and the different choices currently available to farmers in the area. It's the time of year when the footpath team spend very little time in the lowlands (or in the office) and, unless you're a keen hill-walker, we are mostly seen as specks in the distance on the side of a hill. At the beginning of May we led a Working Holiday teaching a group of very keen volunteers some upland footpath techniques at Glenamara Park, near Patterdale in Ullswater. 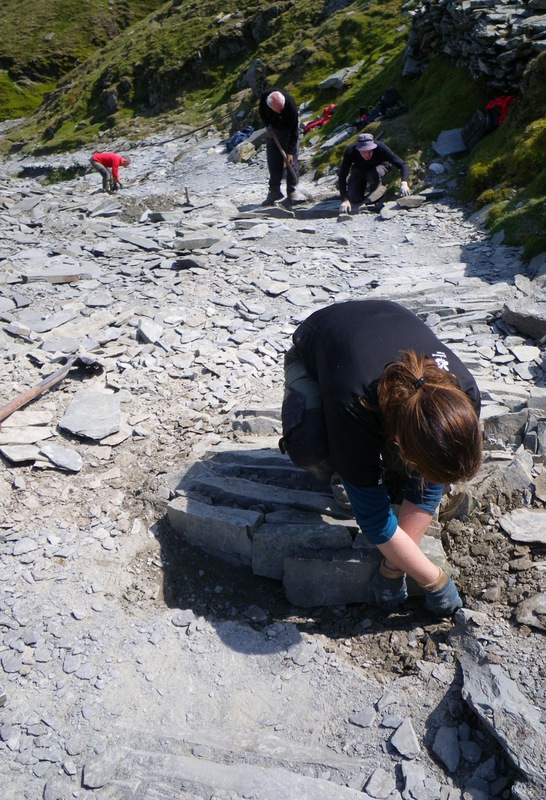 The path is a popular route up to St. Sunday Crag and had stone pitching put in by volunteers about eight years ago. In most places the path is holding up well, but there were some places where it had become eroded, so we replaced stones and landscaped out the eroded places with the hope that people will continue to want to follow the path. The weather was a touch mixed, but as you can see from the photo, that just added a few rainbows to our already beautiful view. You can also see the pitching (step-like stone path) in the foreground. We have had a couple of scorchingly hot work days with the Fix the Fells volunteer lengthsmen. The first was on a popular route route up Coniston Old Man near the ruins of a former slate quarry. We were using a technique that was used to create a hard-wearing but smooth path surface for dragging massive pieces of slate down from the quarries on sledges! Slates are laid so that their narrowest edge forms the path surface. As you can imagine this is a long term project as you don't get many metres of path laid in a day. 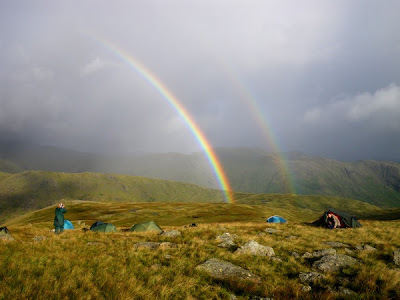 The second lengthsmen work party was high on Helvellyn near Red Tarn. A subsoil path had been created using a digger about 12 years ago and some stone drains put in at the same time had collapsed and were no longer effectively shedding water from the path. Water erosion soon creates gullies and makes the surface unattractive for people to walk on, so our task was to fix the drains. The drains run across the path and have two parallel stone sides and should have a flat stone base. Many of the drains near Red Tarn had no bases at all and that's likely to be the reason why they collapsed as the base helps to hold the sides apart. We scavenged stone from the hillside to put new bases in. We had a great view of Striding Edge and the summit of Helvellyn and were grateful that there was some water around to help us keep cool! The sheep fleeces that you heard about the Basecamp team bagging up in an earlier post have now reached their destination high above Langdale via helicopter! We were involved on the ground on the day they flew, moving the bags to the field where the helicopter was going to land. We were very lucky to have perfect flying weather (helicopters are a bit fragile and the Lake District doesn't always oblige with sun). Sadly I didn't manage to capture the comedy moment when the wind created by the helicopter rotor blades blew the bags and sheep fleeces all over the landing site! However, as you can see below we got all the bags flown successfully to Mart Crag Moor where the Basecamp team are going to be using them to build a path this summer with a working holiday. In the past the footpath team have spent most of their time in the summer working on a single large project. This year our focus has been mainly on doing maintenance on the paths that have already been built. We walk set routes and clear drains of any gravel and mud that has accumulated in them and clear stone pitching of gravel so that it's easy to walk on. We've been lucky enough to go all over the Lake District while collaborating with other teams, so I'll leave you with this panorama of Buttermere and Crummock water from our 'office' for the day on Red Pike. So far no sign of.... A return of the giant Hogweed.... At ferry Nab!! In June 2011, several Giant Hogweed plants were found to be growing alongside the National Trust/SLDC footpath at Ferry Nab. A National Trust Ranger wearing full protective clothing and goggles dug out the plants and then burnt them. 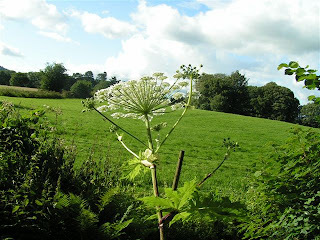 The Giant Hogweed plant (HERACLEUM MANTEGAZZIANUM) is a native of the Caucasus region, and Central Asia. Victorians brought it back for use as an ornamental garden plant. 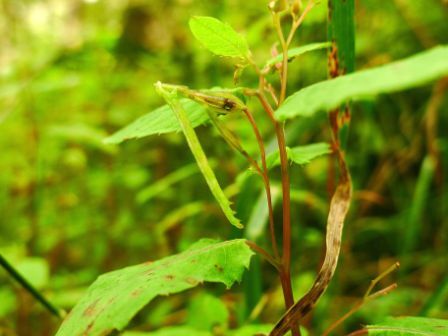 It is able to grow taller than 15 feet, and more! The sap contains “furanocoumarins,”a toxin that photosensitises the skin. Exposure to sunlight causes painful blistering. The scars can take years to heal. A small amount in the eyes has been known to cause temporary or even permanent blindness. This plant often causes river bank erosion...its favourite place to grow. When it dies back in Winter, often only bare ground remains. The Giant Hogweed can easily shade out native plants because it grows so fast and so tall; it becomes dominant very quickly if not controlled. The Giant Hogweed, classed as a biennial, lives for between two to Seven years. 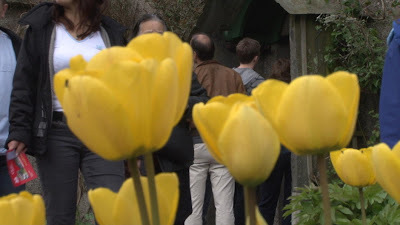 In its final year it produces the flower heads, each containing up to 5,000 seeds, seeding in late August. The seeds remain viable for up to seven years in the ground. A recent survey in this area indicates there is no sign of regeneration of the plant..as yet! Further monitoring will take place later this year. I’ve just had a few days climbing with some friends up in Skye. When we arrived, we were surprised at how much snow there was. There had been a recent fresh flurry of snow and it was looking good. So, for the beginning of our trip, our fingers were quite cold when climbing which was a stark contrast with the last few days when it was absolutely scorching. On our first day there, my climbing partner Steve and I climbed up to the Cioch by a relatively easy route and then carried on to the top of Coir Lagan – a cold-fingers day but really good climbing. The following day we did Pinnacle Ridge on Sgurr nan Gillean. Again, there was a lot more snow than we had initially hoped for but it was great to be back on big hills. On the final day we took a boat into Loch Coruisk and we four stayed at the climbing hut – a beautiful, remote location with stunning views down the loch. The next day we did the Dubhs Ridge and then down the other side to where we were camping. One of the things that always strikes me about Skye is that it is the only place in the UK in my experience where you can have a truly alpine climbing day. The climbing is fantastic with grades from easy to extreme but you do need to be a competent and confident climber. There is some easier walking or non-technical climbing but It would take too long to rope everything so sometimes you need the skills and confidence to move together and quickly. So on this trip, we did three good climbing routes and then had the added bonus of seeing lots of seals and even an otter. We saw the otter just about half an hour walk from our camp where we sat very quietly for about an hour and it worked its way across the shoreline in front of us. The vast majority of people on the camp-site didn’t see it purely and simply because they didn’t look for it. Seeing otters is often a case of finding the right location and just sitting quietly, preferably without a dog because the smell or barking of a dog will scare away otters. It was a good trip but now I am back in the Lakes preparing for a Jubilee Beacon on Catbells and hoping for dry, calm weather! Did you know that next week is Volunteers Week? Volunteers’ Week (1-7 June) is an annual event which celebrates the fantastic contribution that millions of volunteers make across the UK. Here on our South Lakes patch we are particularly lucky to have a very diverse and enthusiastic team of volunteers helping us and we thought in celebration of Volunteers Week we'd join forces with our historic houses blog and mention some of the work done in both the countryside and the houses. During Volunteers Week it will be business as usual for our volunteers but there's no better time for us to say a big 'thank you' to all of them. Here's a quick look at just some of what goes on. As the week begins our volunteers at Hill Top, Beatrix Potter Gallery and Wray Castle, are preparing themselves for our season turning pretty hectic: Hill Top switches to longer summer opening times, the schools go on Half-Term holiday, it’s the main Japanese holiday season, and to top it all the UK is having a ‘Double Bank holiday'. Regardless, our volunteers will continue to help us give exceptional visits to all our visitors. The recent weather has been good for plants (and weeds! 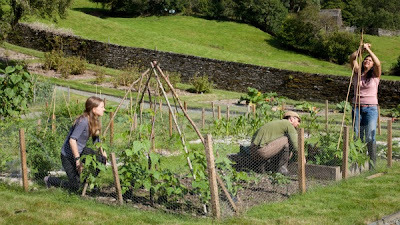 ), so the community growers are busy tending their plots at Monk Coniston's walled garden, whilst our garden volunteers have been helping Pete (the Gardener) make Hill Top such a welcoming traditional cottage garden. In the wider property our Volunteer Path Rangers have been constructing drains near Guards Wood to prevent the damage caused by water; hard work but very rewarding, especially as their own initial surveys identified all the work required; 100s of miles of paths walked and surveyed in all weathers. Some of these hardy souls enjoyed it so much they’ve moved onto our woodland boundaries, and let me tell you there’s a lot of boundaries to survey! 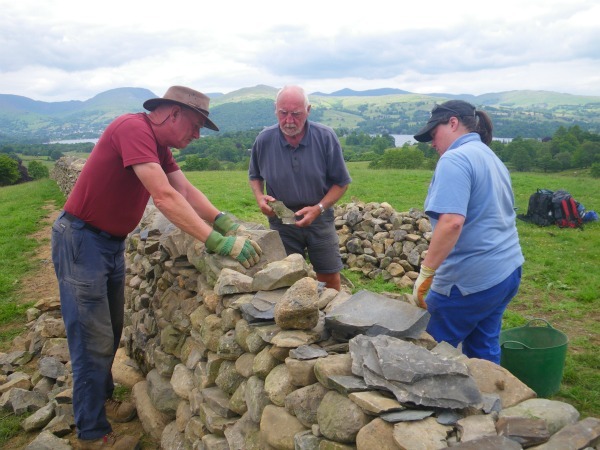 The South Lakes Conservation group has been busy as usual, working hard on some dry stone walls near Windermere, back-breaking but rewarding. You take the one on the right, I'll take the left - one's bound to have gold at the end! 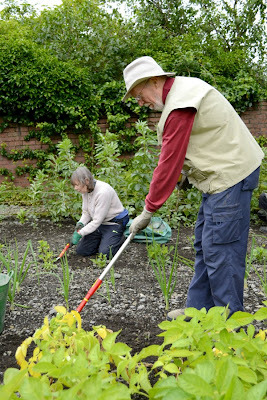 This has been a snapshot of just some of what goes on in an average week with our volunteers, they are always busy with these and lots of other tasks, bringing enthusiasm, ideas, freshness and a sense of fun to our team here in the South Lakes.